The topic for this week is "I wonder..."
Can't wait t o see what you will come up with! For me as I pondered on this prompt, I found that I rarely wonder as I have spent so much of my time trying to live in the moment.....for the moment is all that we have. 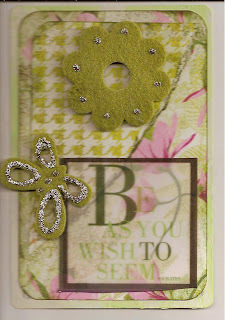 For this card I used felt embelishments on printed paper and added stickles to them. Monica's Place - Winner Announcement!